Categories: SharePoint and Technology. 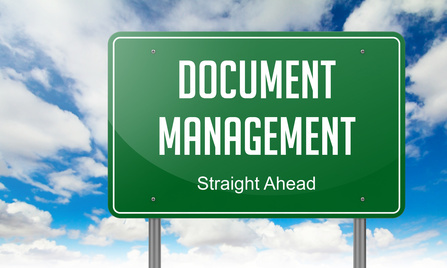 Tags: Document Management, Document Management System, and What Is. Document management is all about proficiently arranging your documents so that they are easy to trace at times of need. Simple steps as using the existing file system tools in a standardized and accepted fashion can improve the overall efficiency of document management. For example, when you save a document as “Tony Printer Order 07-12-2014.doc” rather than “Tony.doc” it is easier to locate the file with Tony’s printer order placed on July 12 as opposed to scanning through the “Tony doc” to find out what it was about. Getting into the habit of arranging documents in standard folders and subfolders that are named meaningfully can immensely help managing documents. It is important that all your staff understand and follow the conventions and you can see these techniques work great in case of small businesses with moderate document output. However, if your organisation handles thousands of documents, simply following a few set rules and conventions may not work. Where centralisation and organisation is a priority, you may want to opt for a professional Document Management System. With an efficient DMS, you can not only track the date a particular file was modified but also the date it was originally created. A DMS will allow you to narrow down your search by date, name of the author or recently modified files. You can search the content of your documents using Boolean or proximity criteria. With a reliable DMS it is simple to locate any information from within your document network. You can define which of your employees or co-workers can read and edit what with a good DMS. In most cases, document protection is governed by network access rules and in case you require an exception to the rule, company help desk needs to be contacted. If you try opening a file that a co-worker is already working on, Windows sends out an alert informing you that the file is in use and you need to create a copy if you wish to work on it. A document management system takes you a step further. Know what time your colleague started working on it, any reason that he/she provided for the revision and the time it should be over. With a DMS, you get document merging and Word’s track changes feature. To add to that, a document management system also allows you to match the original document and the edited version, pointing out the differences between the two. You can specify documents that you would like to be automatically published on the intranet as and when they are saved on the document management system. Define routing rules and approval cycle specifying which employee can see a document and in which order. This helps streamline workflow and makes the entire process of creation, retrieval and editing of important business content seamless. When several people need to work on a particular document, the DMS can automatically route it form one to other in a pre-set order. With hassle free email integration offered by most document management systems, you can now view your important documents from within Microsoft Outlook or other email clients and also save them on to the DMS. Last but not the least, your DMS also provides auto backup and disaster recovery in conjunction with the other backup plans you have, ensuring that all your vital business information is safe. SharePoint is an example of a web application framework by Microsoft that can help you in effective document and content management. It provides employees in a huge organisation spread across an area, the same agility and co-ordination as in case of twenty odd people sitting in the same office. To know more about SharePoint and how it can help your business document management, talk to our experts at Complete Cloud today!